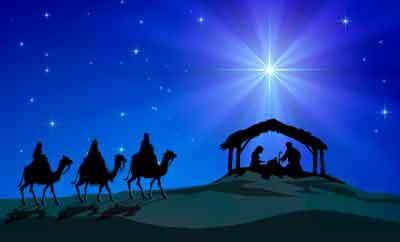 There have been various speculations about the visit of the three kings. We may think of them arriving at the stable about the same time as the shepherds, but traditionally the church has given them space and time to arrive later. In fact, some would estimate a great deal later, and in Nazareth, not Bethlehem, when the child would have been possibly two years old. These three kings left home full of confidence in their royal status and wisdom. They had, after all, discovered the new star and recognised its significance. So they set about preparing gifts fit for a king such as themselves, only more important, with priestly virtues. He would be worthy of only the best, and they were confident that their best would be received with gratitude and admiration. They set out with the star in their eyes, but found the journey more diﬃcult than they had imagined. Traveling by night to avoid the heat, they had to contend with prowling wild desert dogs that made the camels skittish. Sometimes the sky was cloudy, so that they lost sight of the star, and had to stop for a few days until it cleared. From time to time a fierce sandstorm would reduce their world to a few meters, so that they simply had to shelter behind their kneeling beasts until it passed. Eventually they came to place of rich opulence, the sort they were used to, in the palace of Herod. Here, at least they could breath easy, in the company of someone such as themselves. It must have been a relief for them. Herod answered their questions with honeyed words, begging them to return once they had completed their task. But something gnawed at them, until eventually, further down the track, they recognised the malice behind his words. They traveled on, finally arriving at the town over which the star seemed to hover, Bethlehem, only to find that the king they sought had moved on with his family to Nazareth. They rested there, nursing their disappointment, wondering if the journey was worth it all, and did they have enough energy to go on, before wearily heading north. At last they found what they had been looking for, what the star had promised. Only it wasn’t a king in a palace like Herod’s, or a priest in a temple. It was a small child in an ordinary house belonging to, of all people, a carpenter. Yet somehow what they had experience and learnt during their journey had given them the insight to recognise this innocent, vulnerable child as the one whom they sought. Then, having oﬀered their rich gifts, they left for home, but on a diﬀerent path. They knew they could not go home the way they had come. It was dangerous. Too much had happened. Too much to change them. So I wonder… where are we on our own journey to the find the Christ child? Are we still at the beginning, brimming with self-importance, confident of our royal status, our innate wisdom and abilities, and the worth of the gifts we have to oﬀer? Are we beset with dangers prowling around us, contemplating turning back in fear? Have we lost sight of the star, our original beacon that called us out in the first place, or battered by storms that drive us inwards into immobility? Or have we reached what we see as a safe haven among people such as ourselves, who perhaps turn out to be wolves in sheep’s clothing? And do we perhaps see in their duplicity the seeds of tyranny that we ourselves might carry in our own sense of self-importance? And having reached what we thought must be our final destination, are we experiencing the weariness of deep disappointment that makes us wonder if we have the stamina to go on? Have we persisted long enough and learnt enough to have the eyes to recognise the Christ child in weakness and powerlessness and humility when we finally do find him? And do we understand that now, having seen him, we cannot go home the way we came? So…..Where are we on the journey? I don’t think it matters. I think what matters is simply that we are on the journey, that we persist through danger and disappointment, while our sharp edges are scoured and smoothed by sandstorms, until our eyes are finally able to see Christ in the small and vulnerable. It matters that we learn from where we have come so that we take a diﬀerent path home and not repeat the mistakes of the past. It matters that we exchange the star that hangs in the sky way up there for the light who has crept into our hearts through the disarming love of an innocent child, needy of our love, because that light will constantly illuminate of our path an the paths of others with whom we journey, never to be obliterated by dark clouds of grief and death. And when we finally arrive back home where our journey began, we will find our rightful place in the royal household of God, which reveals our true regal status which we have always owned, rendering our own self aggrandisement trivial by comparison. Then, and only then, will we have finally come home in the loving, self-giving heart of the Christ child whom we have sought so diligently. Then we will know that the journey has been worth all our pain and all our joy.